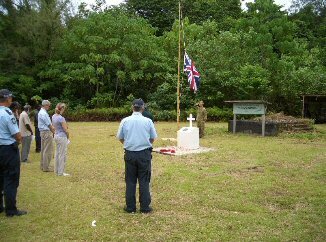 This is a continuation of the story Pilgrimage to Ballalae which describes the erection and dedication of a memorial to the 517 men of the Royal Artillery who died in 1943, as prisoners of the Japanese,on the small island of Ballalae in the Solomon Islands. "I am an ex-British serviceman who is now employed as a federal agent in the Australian Federal Police currently serving in the Solomon Islands. Last year I was flying through the islands when we stopped at Ballalae airfield and I saw the memorial erected to the Royal Artillery POWs who died there constructing the airfield. It was in a poor state so I did a bit of weeding and we left shortly after. I did a bit of research and the Royal Artillery Museum supplied me with a copy of what had occurred there and I finally found your site which led me to a number of your members' stories of their travels to Ballalae, especially Beryl's, and their connection to it. 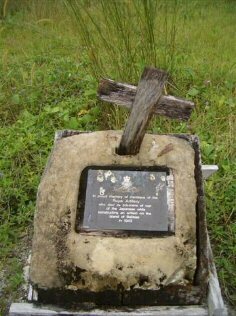 I have put forward to my bosses here in the Solomons that I and a few others repair the memorial and hold a ceremony there on 11th November 2007 and they are supportive of this plan. The reason for this email is twofold. The first obviously is to inform the people who installed the original memorial and supply them with up-to-date pictures of the site and secondly to seek their permission to repair or replace the original memorial. My plan includes keeping the original brass plate to be used on the new memorial and covering the current memorial in new concrete and with a metal cross on top. 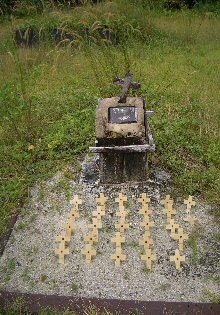 There was a recent earthquake and tsunami which damaged the memorial even more and the original wooden cross is deteriorating rapidly ". We wholeheartedly gave our approval to Phil and he kept us informed by emails and photographs of the progress of the new memorial. 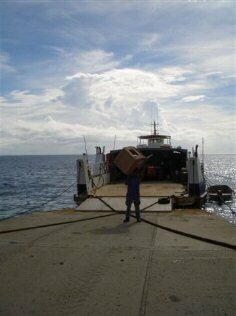 A new formwork and cross were made in Honiara and shipped down to Ballalae on the mv TINA. 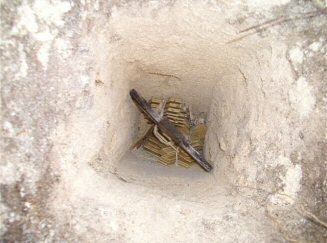 In September Phil and his friend Mark proceeded to remove the old memorial and to bury the crosses,which had survived from the original dedication service in 2003, beneath the site of the new memorial. 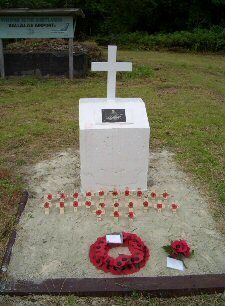 The new memorial and metal cross were then placed in position. Phil had also made arrangements for a memorial service to be held on Ballalae for 11th November 2007. 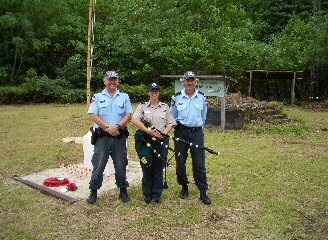 One of his colleagues in Honiara, Jodi, kindly offered to attend the service and to play the bagpipes. On 11th November at the 11th hour a service was duly held on Ballalae which was attended by the Deputy British High Commissioner and his wife, an ex-Governor of the Solomon Islands, the Minister for Tourism, some of Phil's colleagues and a few local people. Jodie, played a lament, Flowers of the Forest, on the bagpipes while the wreaths were being laid. These included a poppy posy from England plus many small poppy crosses from relatives of those who died on Ballalae. The Last Post was played and after a two minutes silence, Reveille was played and the flag raised to full mast. We will NEVER be able to thank Phil and his colleages enough for their kindness in restoring our memorial and arranging a wonderful service there 11th November 2007. Our loved ones died so far away and it is comforting for all family members to know that the POWs ultimate sacrifice on this small island will never be forgotten.